We’re still several movies away from the end of Phase Three, but the folks at Marvel Studios are already planning ahead and working on films to fill up Phase Four of the Marvel Cinematic Universe. Once Avengers: Infinity War and Avengers 4 bring the story up until now to a close, the next phase of the franchise is free to introduce some fresh properties. And one of those, it’s being reported, is a movie based on Jack Kirby’s Eternals. Essentially, the Eternals are a race of god-like humanoids descended from primitive humans who were experimented on by the Celestials. Their mutated counterparts are the Deviants. 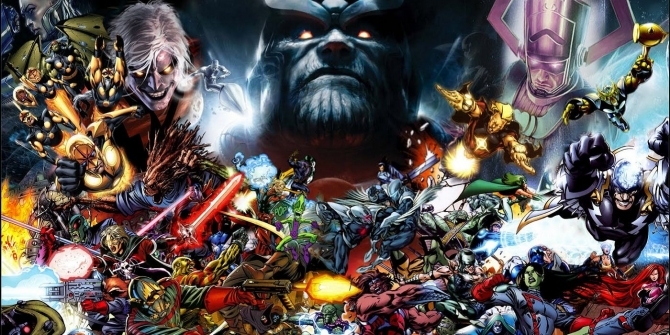 It would be fairly natural to introduce the species in Phase Four as the concept of the Celestials has already been seen in the Guardians of the Galaxy movies and, in the comics, Thanos is actually a Deviant, cast out by the Eternals of Titan due to his disfigured appearance. At the moment, an Eternals movie is just hearsay, but one source claims that the studio is set to officially announce it very soon. Bleeding Cool has been informed by an individual who “has proved ultra-reliable in the past for this kind of thing” that work should be kicking off on the project imminently. Allegedly, Marvel is currently courting writers to pen the script. It’s interesting that, if this report is correct, the studio’s planning to announce their Eternals project so soon after DC revealed that A Wrinkle In Time‘s Ava DuVernay is helming a New Gods movie. Despite being from two separate comic book universes, the properties are closely linked as both are cosmic pantheons of heroes created by Jack Kirby. In fact, Kirby created the Eternals for Marvel after his New Gods comic had been cancelled by DC and he still had a few ideas up his sleeve. Fans should keep an eye out, then, for this alleged announcement. At this point, it seems all but certain that an Eternals movie is on the way and it’s likely just a matter of time now before the House of Ideas makes things official.